Alexei Navalny, who was convicted of fraud in a 2014 verdict that he called politicized, is not allowed to run for president under Russian electoral law, which bars anyone with a criminal conviction from seeking elected office. 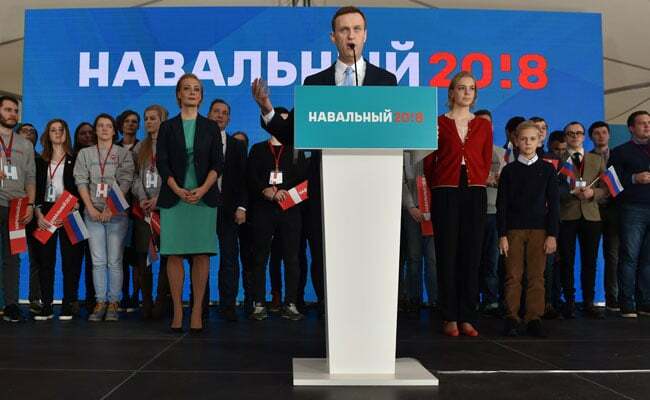 MOSCOW: As a presidential campaign with predictable results kicks off in Russia, opposition leader Alexei Navalny announced his dark-horse bid despite the government's warnings that he will be disqualified before the ballots are printed for the March election. In a small forest and dacha community on the outskirts of Moscow, exactly 742 supporters raised small red voting cards in support of the whistleblower turned opposition leader, who over the past half-decade has become the most dogged foe of President Vladimir Putin. Navalny needed at least 500 people to formally nominate him. "Vladimir Putin, you should not be president anymore," he said during the meeting of an "initiative group" to register his bid. "You are a bad president. You have no positive platform. We are sending you a message in these elections and are ready to win." It was a rare, focused political spectacle in Russia that marked a contrast to the ebb and flow of protest over the past five years, one with a clear political agenda: to register the country's most prominent opposition politician for the presidential election despite a seeming open-and-shut government case to keep him out. Navalny, who was convicted of fraud in a 2014 verdict that he called politicized, is not allowed to run for president under Russian electoral law, which bars anyone with a criminal conviction from seeking elected office. He says nothing in the constitution prevents his bid, which is true, and argues that he should be allowed to run. It is not clear that the argument will hold any water with Russia's electoral commission. But Navalny supporters at the Sunday gathering shrugged off the doubts and reveled in the moment. "The only thing I can compare it to is like a political rally in the West with the confetti coming down," said Danill Bankin, a 20-year-old political studies student who attended the meeting in Serebryany Bor, a wealthy community blanketed with snow on Christmas Eve. "A lot of people say Russians are apathetic, but I think the youths are really becoming active again." There were signs that this is anything but a normal presidential bid. The official address of the registration was: Fourth Street Serebryany Bor, Beach No. 3. It was so cold that the printers froze before they could spit out all the documents needed to be furnished to the election commission. "Everything was perfect, totally in accordance with the law. Even the election workers (who attended the event to ensure everything was above board) had no gripes," said Alexander, a 30-year-old Moscow resident who later joined a protest of about 1,000 Muscovites in Lermontov Square. He did not provide his last name, saying he did not trust journalists and was worried about repercussions at work. He said he was drawn toward opposition politics because of official corruption. "You look at them on TV and you know immediately they're lying. Their mouths say one thing, but their eyes say something completely different," he said. The head of Russia's Central Elections Commission, Ella Pamfilova, has said repeatedly that Navalny would not be allowed to run for president because of his previous conviction. Yet procedure must be followed, and the issue of disqualification would come later. On Sunday, workers at the election commission said they would wait for Navalny to deliver his nomination papers. "We all know that Putin is going to be president," Boris Stoyanov, a 45-year-old history teacher, said at Sunday's rally in downtown Moscow. "But our candidate matters to me, and I'll stand out here until I'm sure that I can vote for him in March."